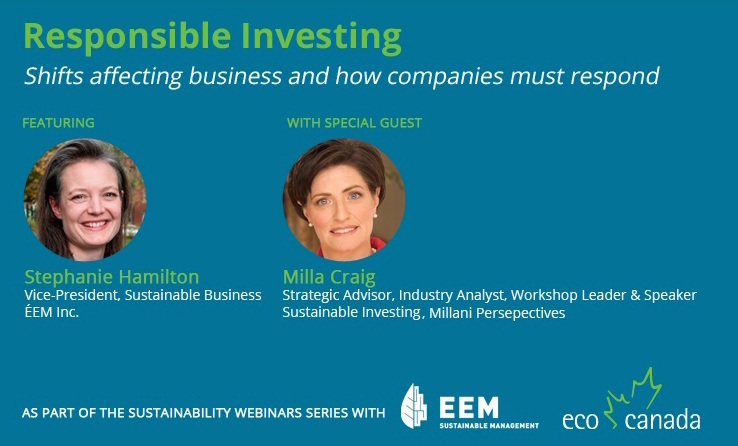 7th March, 2016 – Join Stephanie Hamilton of EEM and special guest, Milla Craig, two experienced professionals in the field of sustainability, as they provide an overview of the current shift towards responsible investing and present examples of how companies are adjusting both their corporate social responsibility (CSR) strategies and their reporting. The webinar is hosted by Eco Canada and will take place on March 23th 2016 at 1:00pm EST. The webinar is primarily hosted for the organisation’s membership of environmental professionals, but is also open to public. Presented in English, the webinar is free to attend, but space is limited.